New event, new rules! The TETRIS® 99 Grand Prix 2 is on from 14:00 (UK time) on April 12th until 07:59 (UK time) on April 15th! During the event, earn points each time you place 80th or above. With every 100 points, you'll get a chance to win 999 Gold Points, worth £9.99 in Nintendo eShop! We had the announcement of the second Tetris 99 Maximus Cup, and we now have info on the EU version of that tournament. You don't have too many days left to practice, so work out your strategies while you can! 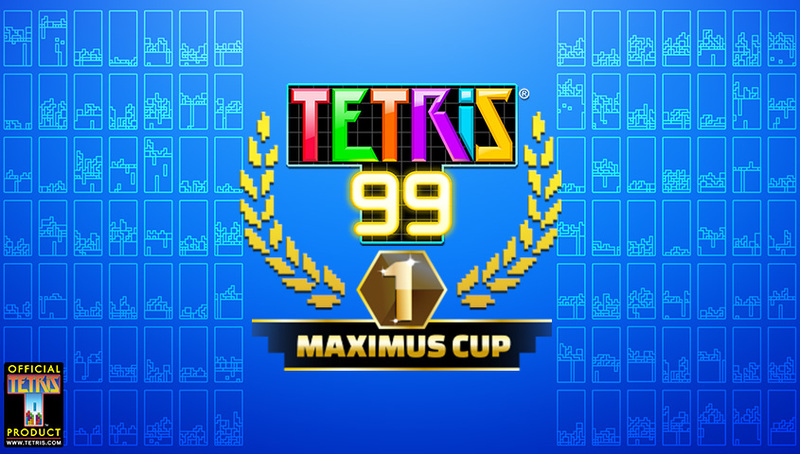 The Tetris® 99 MAXIMUS CUP is back ... and players of all skill levels can join in on the fun! From April 12 at 6 a.m. PT through April 14 at 11:59 p.m. PT, just start playing the game to enter. 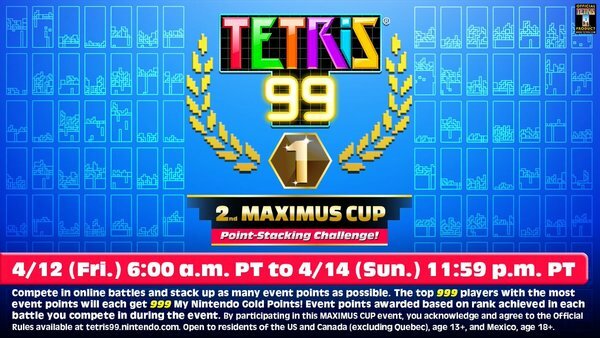 The Tetris 99 2nd MAXIMUS CUP is different than the first one, as you don't have to win first place to score points. Even if you place high during matches, but don't win, you could still come out on top. Don't miss out and feel like an awkwardly placed L-Tetrimino. Slide into this online event like an I-Tetrimino fitting snuggly into the side of a full Matrix and have a high-scoring blast! An exciting time to be a Switch owner! Nintendo is hitting Japan with all sorts of billboards for already-released and up-and-coming Switch titles. Above you can see a billboard for Fire Emblem: Three Houses, which takes an interesting approach to promotion. I wonder if the woman featured is a familiar face in Japan. As for the billboards for Tetris 99 and the Nintendo Labo VR Kit, you can have a look at those below. Tetris 99 has been bumped up to Version 1.2.0 tonight. We don't have official patch notes, but we do have some info on what's changed. - We have implemented a system that grants points based on place ranking while an event is ongoing. - This update also includes various minor gameplay fixes. Can you take the top spot? Well there's a great bit of promotion for Tetris 99! A free-to-play game that gets a TV commercial. That should move a few Switch Online subscriptions! Did you take home a win in the Tetris 99 Maximus Cup? If so, keep an eye on your inbox. Nintendo is reaching out to winners right now to give them their 999 Gold Points. You can also keep tab on your My Nintendo account to see if the Gold Points have been deposited. Have fun spending your big earnings! Tetris 99 is probably the most challenging Tetris game yet. When you're going up against 98 other players, the pressure is really on! How can you take home that all-important victory royale? Perhaps these tips from Tetris professionals can steer you in the right direction! 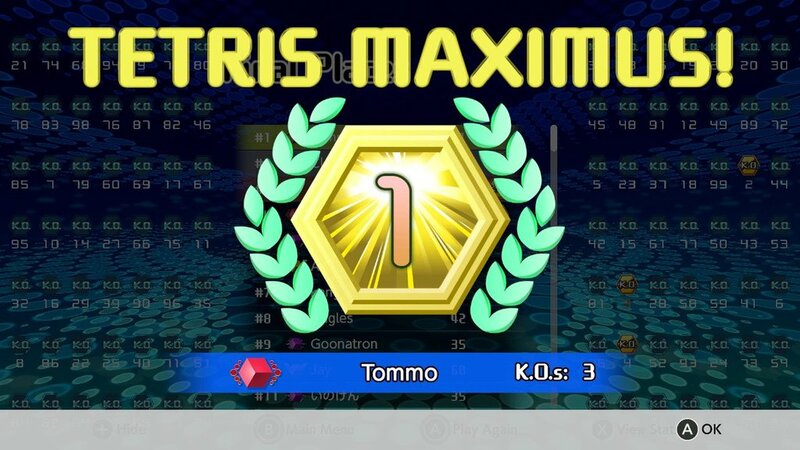 Show off your skills in the TETRIS® 99 Grand Prix! 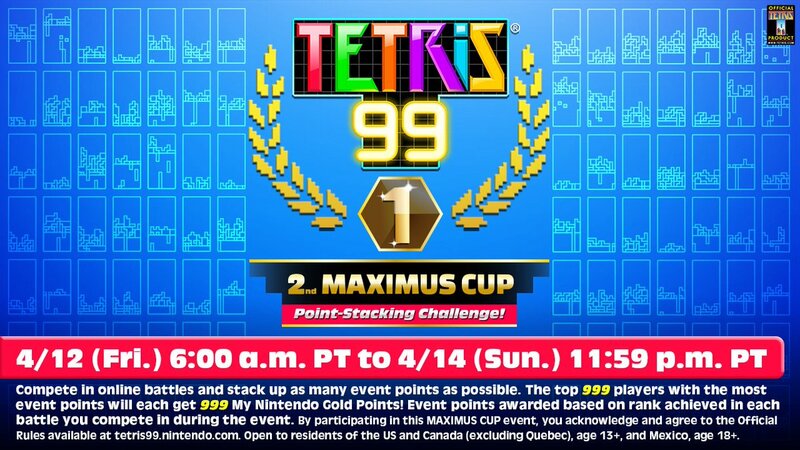 Take part in this special online event in TETRIS 99, from 13:00 (UK time) on March 8th until 06:59 (UK time) on March 11th, and you'll be in with a chance of winning 999 Gold Points, worth £9.99 in Nintendo eShop!